Gallia Academy head volleyball coach Janice Rosier smiles during a break in the action in the Blue Angels’ sweep of Chesapeake on Sept. 11, 2018. COAL GROVE, Ohio — Milestone nights are nothing new for the Blue Angels, but that doesn’t make them any less special. 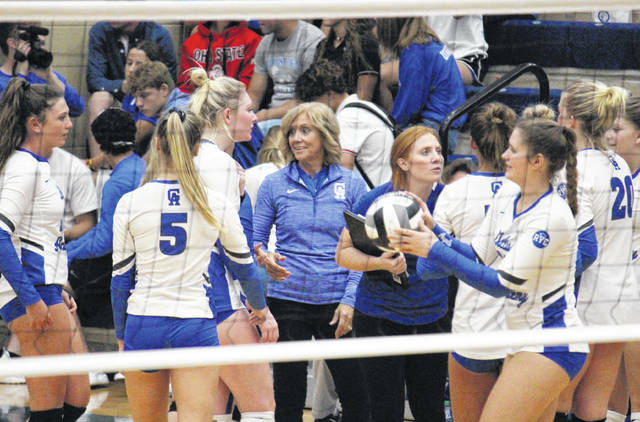 The Gallia Academy volleyball team picked up a straight games sweep of Ohio Valley Conference host Coal Grove on Tuesday night in Lawrence County, giving fifth-year GAHS head coach Janice Rosier career win No. 100 in just 113 chances. Gallia Academy (13-2, 9-0 OVC) — which has now won 38 straight conference matches — led wire-to-wire in the opening game, leading by as many as 18 points en route to the 25-10 victory. Coal Grove took lead for the first and only time in the match at 10-8 in the second game. GAHS scored the next three points before the Lady Hornets tied it at 11, and then the Blue Angels claimed the next 13 points, and 14 of the next 15 to seal the 25-12 victory. Gallia Academy never trailed and posted a perfect side-out percentage in the final game, sealing the sweep with a 25-5 victory. For the match, GAHS had a side-out percentage of 69.0, while Coal Grove’s was 25. The victors pounded out 27 aces and earned a serve percentage of 89, while pounding down 33 kills for a 38.1 hitting percentage. CGHS had four aces and a 94.1 serve percentage, while posting a sub-zero hitting percentage after just three kills. Alex Barnes led the Blue Angels with 18 service points — 14 of which came in the second game — to go with six aces. Peri Martin finished with 15 points and six aces, after earning 14 straight points in the final game. Ashton Webb had 11 points and a match-best nine aces in the win, Bailey Barnette added 10 points and five aces, while Taylor Burnette earned one point on an ace. Webb paced the hosts at the net with 18 kills, followed by Barnes with seven kills and a block. Maddy Petro finished with four kills and one block, Maddie Wright came up with three kills, while Aubrey Unroe finished with one kill. Martin recorded one block and a match-best 31 assists for the Blue Angels. Burnette led the Blue and White on defense with 10 of the team’s 25 digs. Jaidyn Griffith and Haley Booth each had four points for the Lady Hornets, while Addi Dillow earned one service point. Griffith was responsible for all-4 of Coal Grove’s aces. The Blue Angels also swept Coal Grove in the second game of the season at GAHS. Gallia Academy returns home on Thursday to face Portsmouth.